Fashion Knitters are likely to be found watching "What not to Wear". They shop everywhere assessing high end and low end sources for upcoming trends.They love going to movies that are costume dramas as they know next seasons runway fashions will be impacted if the movie is a hit. This Knitter often answers to the name "Fashionista". They always understand phrases like "zebra is the new leopard." Fashion magazines provide updates about the latest trends that are discussed in groups of fashion Knitters. Some variates of this Knitter only knit at social gatherings. They will pull out the same pair of socks at every grouping because they don't knit at any other time. The other more common variety is an obsessive Knitter who has a different project at every occasion. They are usually working on multiple projects, as not all are suitable to carry away from home. Socks are a common carry around project due to their small size. They are frequently seen carrying double pointed knitting needles tubes. These Knitters are often observed at coffee shops, yarn stores and guild meetings. In Toronto they have an annual subway Knit-a-long event. You can learn more here. Social Knitters have vocalizations common to all Knitters; what are you making, where did you get the yarn, what's the fibre? Most can list off all of the items on the Knit Picks travel and storage section by heart. 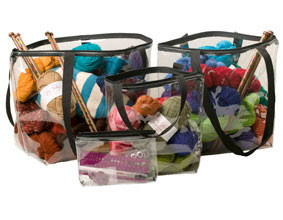 The merits of the various knitting bags are often debated and most of these Knitters own many types. I would say ROFL, but the floor is too messy for that, so LOL. Thanks for the cheer! Your Field Guide to Knitters is very fun reading! I was so glad when Part Four finally included a category that resonated with me. I now know that I am a fashion knitter and this explains why, when sitting at guild meetings around social knitters, lace knitters, or charity knitters, I so often felt out of place and why I would rather knit alone while watching Project Runway. Thanks for the insight!